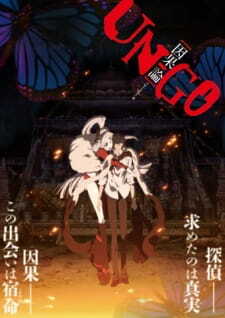 UN-GO has always been an anime about mysteries, and in this prequel movie we deal with an important one; just how did Shinjuuro and Inga meet, and what were those events we saw in the very first scene of the series? Despite the fact this is a film, it is more of a double length episode, so don't go expecting a massive improvement in the art or a whole new soundtrack, because you will be disappointed on both counts. However, the art and music for the series was great, and so it still is here, so whilst it isn't movie levels of animation, it's still more than satisfactory, and the music still does it's job as well as ever. The story does not start with the meeting, but with Shinjuuro's back story. This was well done as it shed some unexpected light on him as a character, and also explained some of his traits, which I appreciated, since it's nice to be able to understand more about a character. Strangely, the film decides to deal with a separate mystery dealing with a religious cult as well as the encounter. Whilst the characters involved all have relevancy to Shinjuuro and the meeting, I thought the mystery was unnecessary, and the time could have been better spent on looking at the events leading up to the fateful encounter, which developed the relationship between Shinjuuro and the members of the travelling group of singers, in particular Yuuko, who is of painful significance. Despite the fact I said the time could have been better spent, the mystery isn't bad (although if you've watched the series you'll know what's going on from the very start) and it is does give some context to the relationship between Inga and Shinjuuro and the deal they have. Because of our prior knowledge of Bentenmaru there is no mystery for us which is a little disappointing, but the way Shinjuuro solves the mystery is still interesting, and the climax had a lot of tension, so I'm summarizing it was done well. UN-GO episode:0 Inga-ron is enjoyable and has a lot of intrigue, and is a must watch if you have watched the original series; the mystery was decent and it did a good job of explaining and revealing things regarding the original series. It also gives quite an amusing look at some of the characters of the original series before they knew each other properly, which brought a smile to my face at several points. It could have been better, but it was still a solid movie that should be watched. The truth is only right way to go that’s why I keep walking and finding liars. As you may now if you watched the series this is basically prologue to series. And it will make some things clear to you like how Inga was born and why she teamed up with Shinjuurou. Also it tells how Kaishou became interested in spying Inga and Shinjuurou. I would say these all were some kind of interesting but not so much to say about these. We have a man who cannot solve a case and freak girl who keeps frightening people with her abilities. Inga’s child form is quite funny actually but I prefer adult form more. Because she looks more beautiful in that form. At First when I watched series it looked very weird but I guess it was my imagination doing tricks. But it’s really interesting and shapes are done greatly. Environment is basically a many buildings covered in huge center point. Although there is some caves too and they look kind of dark styled. I have to say say ED in ending of this movies is really catchy and it really makes characters moving look cool and phaseful.OP theme is also great but not so good like ED but I would still listen both and then decide which one you liked better. I didn’t notice any great theme songs playing in this movie so yeah nothing so memorable there. Movie was enjoyable because you can actually learn something really cool related in series. I watched whole movie in one sitting so yeah it was great. But not awesome. UN-GO is series that should have first this Movie then series because you don’t know much about when you start watching series but if you found this movie first and watched it then you were lucky and basically now much about story and maybe you like series too. I would still give this movie chance. Because not every anime series they make movies. And especially Mystery, detective kind of like.